Later we got a chance to play with Storage by using Storage V-Motion. So VMware leftover with couple of other boundaries like Network (Layer 2), other Data Center and other vCenter Server …. 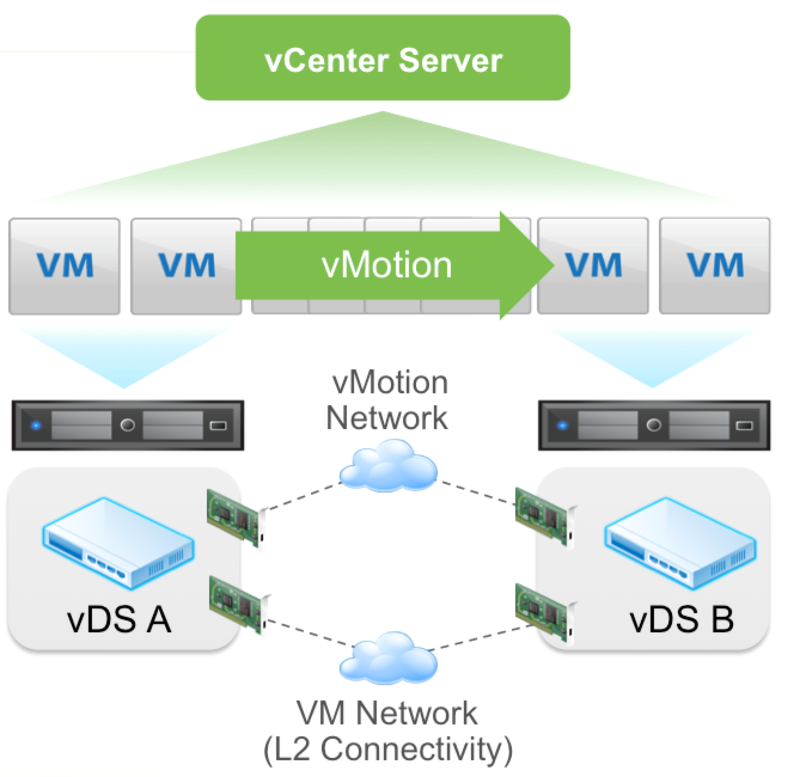 Let us learn new vSphere 6.0 enhancements for V-Motion. Not just from vSS to vSS but also from vSS to vDS and vDS to vDS. Note that vDS to vSS is not supported. This is because when migrating from vDS metadata of the VM is transferred as well and the vSwitch does not have this logic and cannot handle the metadata. Note that the IP Address of the VM that you are migrating will not magically change, so you will need to make sure both the source and the destination portgroup belong to the same layer 2 network. All of this is very useful during for instance Datacenter Migrations or when you are moving VMs between clusters for instance or are migrating to a new vCenter instance even. vMotion previously could only occur within a network managed by a single virtual switch, either a Virtual Standard Switch (VSS) or Virtual Distributed Switch (VDS). vMotion across vCenters will allow VMs to vMotion to a network managed by a different virtual switch effectively switching the networks seamlessly. Not only can you move between vCenter Servers but you can do this with all the different migration types there are: change compute / storage / network. You can even do it without having a shared datastore between the source and destination vCenter aka “shared nothing migration. This functionality will come in handy when you are migrating to a different vCenter instance or even when you are migrating workloads to a different location. Note, it is a requirement for the source and destination vCenter Server to belong to the same SSO domain. When the VM is migrated things like alarms, events, HA and DRS settings are all migrated with it. So if you have affinity rules or changed the host isolation response or set a limit or reservation it will follow the VM which is very cool stuff. A datacenter was the highest point in the vCenter architecture…. But long distance vMotion can now get over it. Long Distance vMotion. Maximum tolerated latency was 10ms for vMotion with earlier version and wit this new feature that just went up to 100ms. Long distance vMotion uses socket buffer resizing techniques to ensure that migrations succeed when latency is high. Note that this will work with any storage system, both VMFS and NFS based solutions are fully supported. This feature still under testing and we may get more latency requirements with actual release.